A sunny day on the river turned into a baby moose rescue mission Saturday afternoon when a group of Alberta boaters spotted something peculiar in the muddy riverbank. 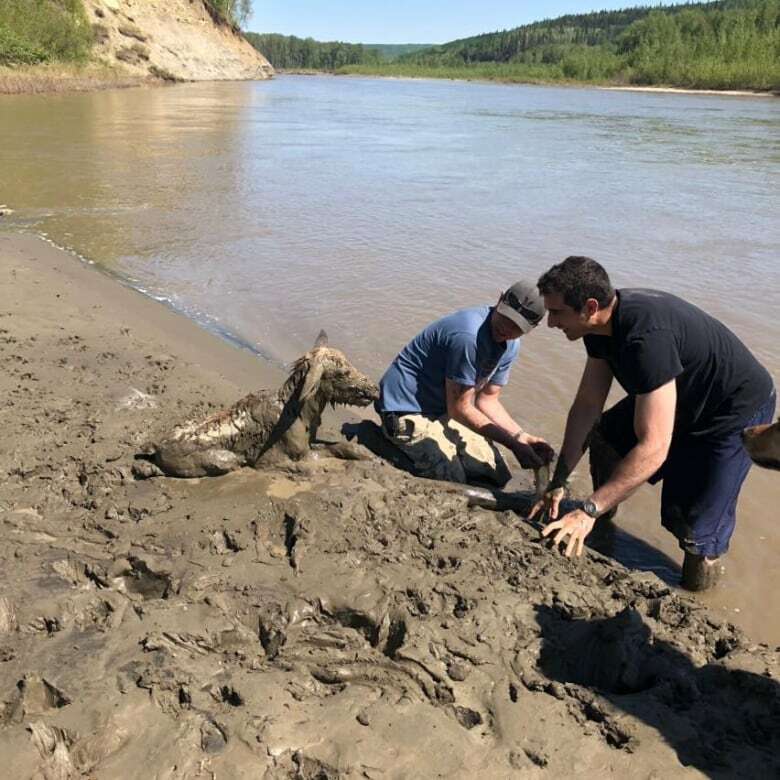 A sunny day on the river turned into a baby moose rescue mission Saturday afternoon when a group of boaters from Grande Prairie, Alta., spotted something peculiar in the muddy riverbank. Kane Savidan had just pulled his boat onto a sandbar in the Wapiti River, near Bear Creek. He was unloading the cooler and chairs when his cousin heard a mewing sound a short distance away. As they walked closer, they realized the sound was coming from a baby moose that was almost fully submerged in the muddy riverbank. Why do moose frequent the residential areas of south Edmonton? "All you could see was its head and the top of its back sticking above the mud," Savidan said. "It couldn't even see, it had mud covering its eyes completely." The group managed to pull the moose calf from the mud and brought it closer to the water, where they washed the mud off its face. At first, it couldn't stand up. Savidan thinks the moose was barely two weeks old. They carried the calf to a drier spot on the river to let it recover. Savidan drove upriver looking for a stronger cellphone signal to call a fish and wildlife officer. The officer told them to leave the area, as the mother was likely nearby. "That's something we were all worried about too," Savidan said. "You hear of more moose attacks from cows protecting their calves than bear attacks, really. So we expected the mother to be close by." When he returned, the moose calf was standing and wandering around, even touching noses with the group's golden retriever. "He wasn't scared of us, he wasn't frightened. He would just kind of follow us around on the beach," Savidan said. The boaters packed up and headed to another area of the river to have a fire. When they returned a few hours later at around 5 p.m., the calf was gone, its tracks heading into the woods. Savidan figures the calf got stuck in the mud that morning, perhaps when its mother came to the river for a drink. He noticed larger tracks farther up the riverbank from where the calf was found. "It probably wandered a little bit too close to that muddy area and got stuck in there," he said. "I just hope it found its mother."